The future of medicine starts today…with you. Join the President's Research Council and sustain scientific discovery, from bold ideas to proven innovations in health care. Support the annual Distinguished Early Career Researcher Awards, which are given to faculty members early in their research careers when federal grants can be difficult to obtain. Receive invitations to the annual awards dinner as well as four stimulating presentations by prominent faculty researchers. Meet outstanding medical scientists whose work is revolutionizing the scope and practice of medicine in North Texas and around the world. Connect with like-minded community and business leaders who also support UT Southwestern Medical Center’s unwavering pursuit of excellence in medical research. A portion of your President’s Research Council annual member contribution is tax-deductible. Membership starts at $1,000 for individuals and couples. We welcome membership contributions of larger amounts, which will enhance funds available for annual research awards. 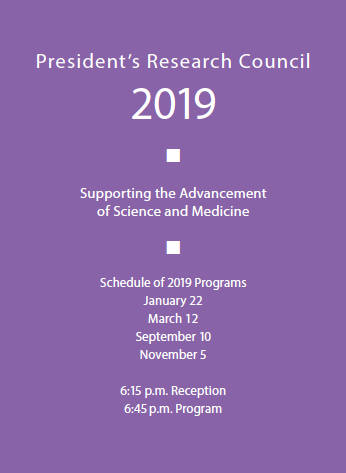 See the 2019 program listing and discover some of the benefits of joining the President's Research Council by viewing our brochure.